In the determination of the reference system satellite orbit determination plays an important role. With purely geometric techniques it is not possible to determine e.g. the position of the Earth’s centre of mass. However, the introduction of dynamic techniques, such as satellite tracking, is accompanied by a range of parameter definitions and assumptions. These make the determination of the reference system and related parameters dependent on the assumed parameter values, but also on the type of tracking data that is used. 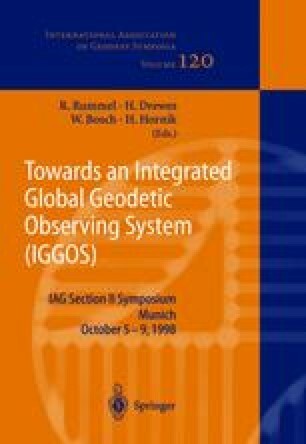 In conclusion it becomes obvious that the accurate establishment of reference frames and datums, precise orbit determination of several satellites, satellite tracking and gravity field determination are heavily interlinked subjects that require an integrated processing.